Nothing marks the onset of spring like the release of the latest vintage’s delicate pink wines. These flamingo-hued libations are extremely popular with wine novices and experts alike – they are fresh, easy-drinking, packed with aromatics, inexpensive, low in alcohol, and utterly delicious. In Portugal, pink wines are called rosado. In Spain, they’re rosato. In France and the US, it’s called rosé. Rosé wines are made in many countries around the world, but some of the most famous rosé wines are from Provence and Bandol. These wines exhibit great finesse and elegance, and are usually totally dry (no residual sugar). Rosé wines can be made with any red grape, such as mourvèdre, grenache, pinot noir, and syrah. Many mass-produced, cheap rosé wines are packed with sugar and taste like candy. These are the wines that give rosé a bad name. In general, you could expect to spend $15-$30 for a good or great rosé wine. I’ve seen them cost as much as $60, and those are typically very special. Domaine Tempier is well-known for their expensive and cult-status rosé from Bandol. One interesting thing about rosé wine is that it’s seasonal, fragrant, pretty, and short-lived, much like a wildflower. It’s usually bottled in late winter or early spring following harvest, and makes it to market by April or May. It provides the winery with a product they can get to the market much more quickly than a red wine, since rosé is ready to drink as little as 4 months after the grapes are picked. Red wines typically require at least a little age, and can take a year or longer to make it to market. Rosé generally doesn’t age very well, if at all, and should be consumed within the first year following it’s release. For example, you wouldn’t want to purchase a 2011 or 2012 rosé in 2014. You’d want to wait to see the 2013 rosé wines. There will, of course, always be exceptions to this rule – but it’s a good guideline to follow when purchasing rosé wine. Do you know how rosé is made? Sometimes it’s a byproduct of red winemaking, and other times the grapes are picked early and pressed specifically for rosé wine. There are a couple of methods, detailed below. The saignée method. In French, it means “bleed”. It starts with grapes picked with the intent of making red wine. The grapes are crushed and/or de-stemmed; all the sweet juice and grape skins hang out together in big vats in preparation of fermentation. The winemaker will bleed off some of the pink juice after it’s been briefly in contact with the skins. The amount of time this juice sits on the skins dictates how saturated in color the finished wine will be. This saignée is typically performed to make the red wine more concentrated, since the process increases the skin-to-juice ratio of the red wine by removing some of the juice. 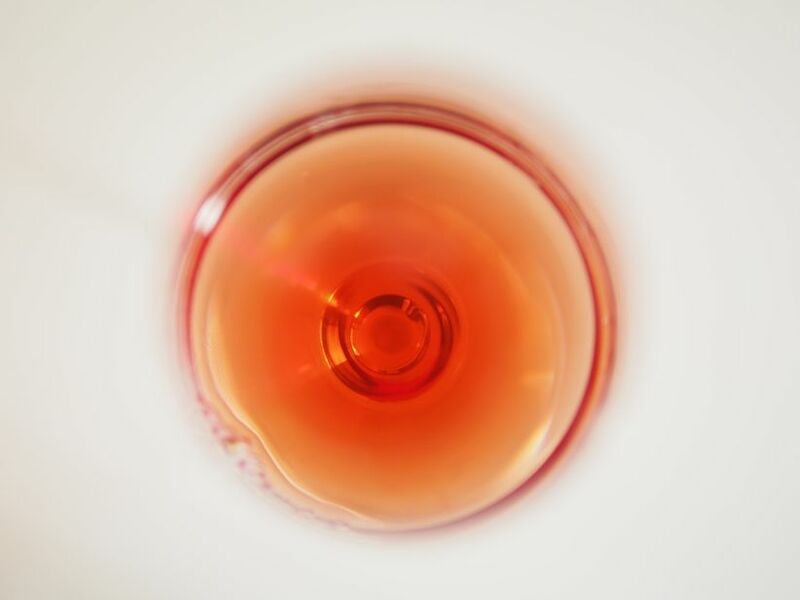 The saignée ends up being a byproduct of the red wine-making process – the pink juice that has been bled off is fermented separately and bottled as rosé. Vin gris. French for “grey wine”, which is a little misleading since the wine is not grey. In this method, the red grapes are picked specifically for making rosé, and they go directly to the press just like a white wine. The juice spends no time on the skins at all, which results in a wine that is a very pale pink or in rare cases even white in color. You will see French and sometimes American rosé labeled Vin Gris if it’s made with this method. These rosé wines tend to be lower in alcohol, since the grapes are usually picked at earlier ripeness levels. This is a stylistic choice, but seems to be the norm for vin gris. There are other wines that qualify as rosé, but are made in various experimental methods. For example, Antica Terra of Oregon makes a rosé of pinot noir (shown below) that spends 6-8 days on the skins during fermentation. It’s then siphoned off the skins when some (but not all) of the sugar has been converted to alcohol, and is then racked into a neutral oak barrel. The wine finishes fermentation in the barrel, and stays there on the lees for several months while it ages (generally I avoid rosé wines fermented or aged in wood, but this is one exception – it’s unreal). Because it’s pinot noir, which doesn’t have a lot of color to begin with, and because it’s pressed early, the wine is not really red, but more of a rosé. Technically, it’s a red wine, but the TTB (the government agency that regulates wine label contents) requires the producer to label it as a rosé. 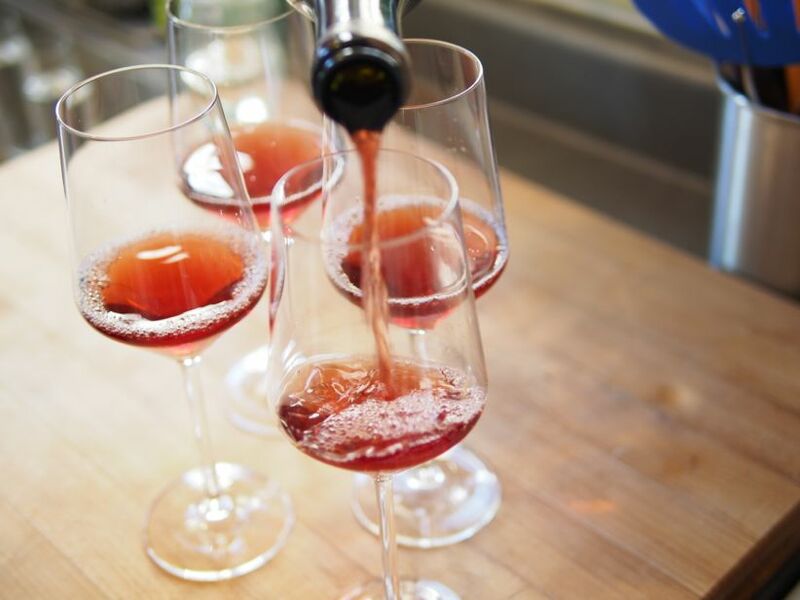 During the vinification process, rosé wines are typically fermented in neutral vessels such as stainless steel or cement (as opposed to oak, which could impart flavor into the wine). Some rosé wines are fermented or aged in oak, and this is a stylistic choice – however, most of them (in my experience) are awful. The Antica Terra rosé of pinot noir, discussed above, is one exception I’ve come across. You can also boost the aromatics in a rosé wine by fermenting it at cool temperatures (for example, below 60F). The cooler fermentation helps preserve fresh, high-toned fruit aromas. I’m not sure why – I’m sure someone out there knows the answer – but this is common practice with white and rosé winemaking to ensure a bright and luscious bouquet. Rosé wine is frequently associated with aromas of watermelon, strawberries, and herbs. It’s not usually very complex, and the prices reflect that, but the lack of complexity does not take away from the joy you experience while enjoying a glass. Rosé is the ultimate food wine, pairing wonderfully with spicy foods such as Thai, Mexican, chili, and barbecue. It also pairs great with salads, salmon, charcuterie, winter squash, root vegetables, roasted peppers, and pretty much anything pink. When you shop for rosé, look for fresh and young bottles from producers you trust – Arnot-Roberts, Matthiasson, Domaine Tempier, and Porter Creek all make rosé that we feel is exceptional. Don’t worry too much about it – if it’s well made and dry, chances are it’s going to be great. Is there a producer making rosé that you love? Let us know in the comments! I am feeling pretty inspired by our trip last weekend to Perrucci Family Vineyards. Harvest was in full swing, and we watched them pick thousands of pounds of beautiful fruit. 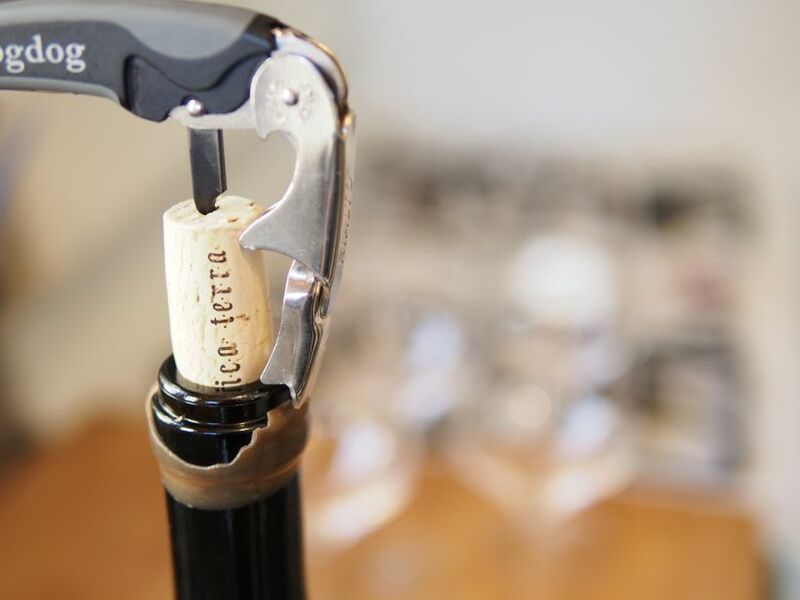 The Perrucci’s produce a lot of wines, but their flagship is made from Cabernet Sauvignon. Above is a photo of some of their estate fruit, hiding safely behind some bird netting. 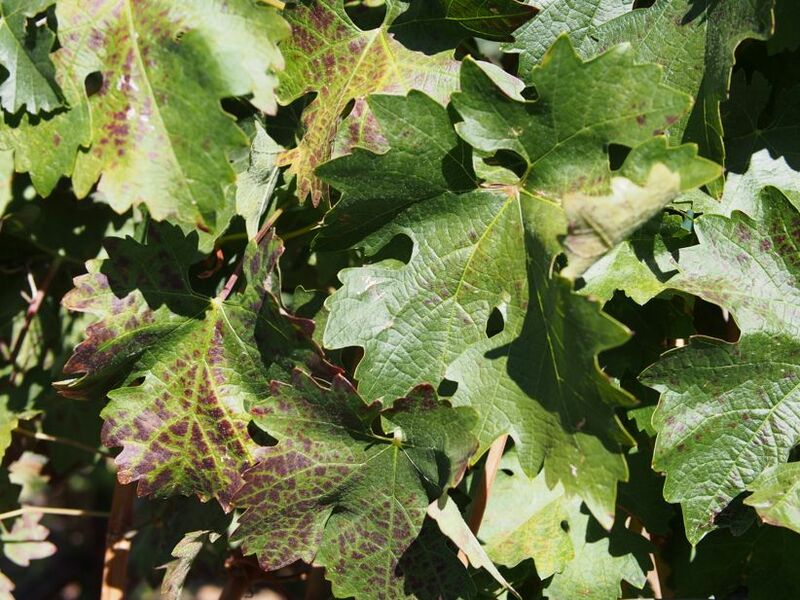 Cabernet Sauvignon is a cross between Cabernet Franc and Sauvignon Blanc. That’s right, it’s half red grape and half white grape. Totally odd, but grapes are funny like that. It originated in southwestern France in the 17th century, and since then it’s become the most widely recognized grape in the world. It’s planted in nearly every major wine producing country and makes some of the world’s most sought-after, expensive, and powerful wines. It’s pretty easy to grow, due to its thick skin and resistance to rot and frost. It’s America’s darling for sure. 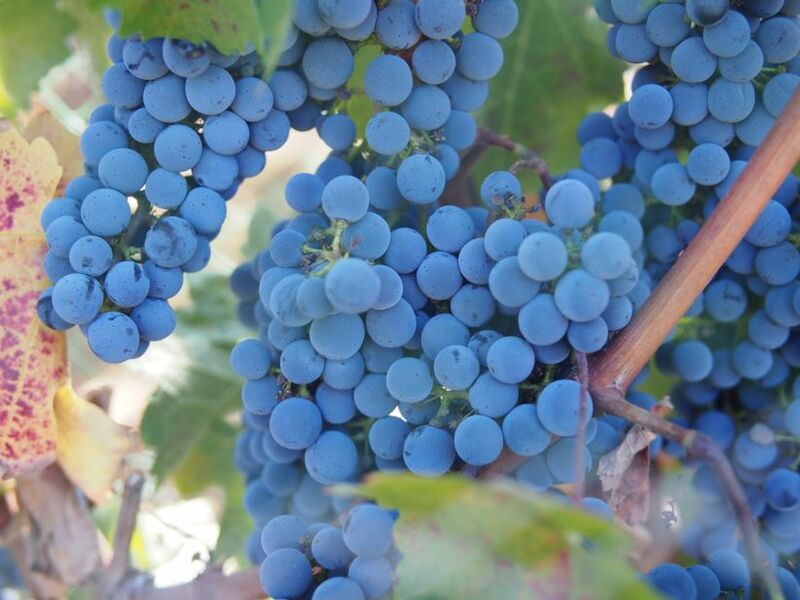 The style of Cabernet Sauvignon wines can range from low in alcohol, restrained, lean and austere to ripe, spicy, and powerful with lush flavors and round edges. Cab tends to be lower in acid than other grapes, which means that it has to be grown and made into wine very carefully if it’s going to be built for long-haul aging (acidity helps preserve a wine). Many high end cabs are built to age, but most of them you find in stores are meant to be consumed within the first 3 or 4 years. If you spent less than $40 on your bottle of cab, chances are you should drink it up sooner rather than later. Pairing food with rich, red wines can be a little tricky, but there are some rules of thumb you can follow to ensure the best results. First of all, tannin plays a major role in the types of food you can pair with a wine. Young, tannic cabs should never be paired with spicy food, because the tannins will make the spice even hotter (sometimes uncomfortably so). Additionally, tannins pair harmoniously with fatty meats, such as a rib-eye steak. Softer, aged, or less-tannic styles of cab are better off with leaner cuts of meat like a filet mignon. Acidity also plays a role – it helps cut through the fattiness like tannins do. Think of a rich, firm tannined, juicy young cab paired with slow-braised beef or lamb. YUM. Red meat really is the classic accompaniment to Cabernet Sauvignon, so you can’t really go wrong with it. Just be sure to match your tannin with the fattiness of the cut of meat and you will be in for a treat. One final thing to consider when pairing a cab with your meal is that it can clash with certain vegetables. Tannic red wines do not go well with brussel sprouts, asparagus, and artichokes. So if you are cooking up a veggie to serve along-side your delicious steak, steer clear of those. Choosing the correct stemware for your Cabernet Sauvignon is also a great way to accentuate its complex flavors and aromas. I like to serve it in a “Bordeaux” style wine glass; a large bowl, tall sides, and tulip shape with bring out the best in your cab. The shape of the glass increases the rate at which the wine oxidizes, softening the tannins and showcasing the complexity. While it’s always best to drink your wine out of the proper glass, any large wine glass will do in a pinch. The world’s finest Cabernet Sauvignon comes from the Bordeaux region of France, but Napa is making some strong contenders as well. We really love Cathy Corison’s cabs, made with organic, dry-farmed grapes grown between Rutherford & St. Helena in the Napa Valley. She makes wines with power, grace, and elegance. The style leans towards restrained and low in alcohol, which is unusual for the Napa Valley. She is one of the oldest-school winemakers in the area, her career starting in the 1970’s when it was unheard of to have a woman as a winemaker. She is an inspiration to us ladies in the wine biz, and having met her just once I was in awe. If you see Cathy’s wines for sale, be sure to pick a bottle up. Whatever your persuasion is, Cabernet Sauvignon is a great grape to get started on if you are just getting into wine. It’s the “gateway wine” for many, and it might just make you fall in love. What are your favorite cabs? Let us know in the comments!